If you go down to Wildwood today…you’re sure of a big surprise. Well, at least I think you’ll be pleasantly surprised! 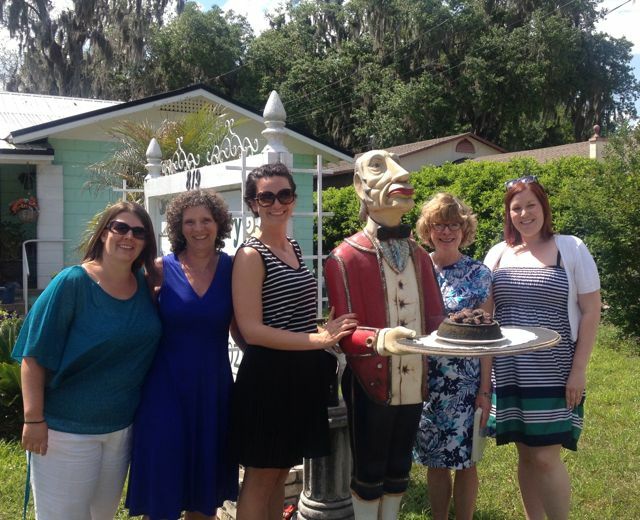 After my recent adventures in The USA, whilst staying at The Villages in Florida I got chatting to a stunning lady (both in beauty and in passion) called Trish and we found ourselves swapping notes on the city of Bath and my recent visit there to review this historic UK destination. She had visited years ago and had an equal love for this beautiful place. Over a family barbecue, compete with a stroke of some very shiny Harley Davidsons, we enjoyed some very “British” fish & chips and American beers and found ourselves chatting about afternoon tea as well as the etiquette around it – naturally! Trish told me that her friends don’t usually tend to enter into this very British pastime, so she would usually sample her local offerings alone… or not at all. After mentioning of an afternoon tea place in Wildwood, just outside of The Villages (where we had been enjoying some fun times golf buggying around this extensive destination! ), we agreed that this must be on our destination list before we left for home. I simply wasn’t going to allow her to head there alone when it sounded like a fab place to enjoy my first (and only) British cup of tea whilst in the States. What I wasn’t expecting was to be dressed up in my afternoon tea best the very next day and headed to a part of town that I wouldn’t say was where I’d expect there to be a traditional British tearoom. 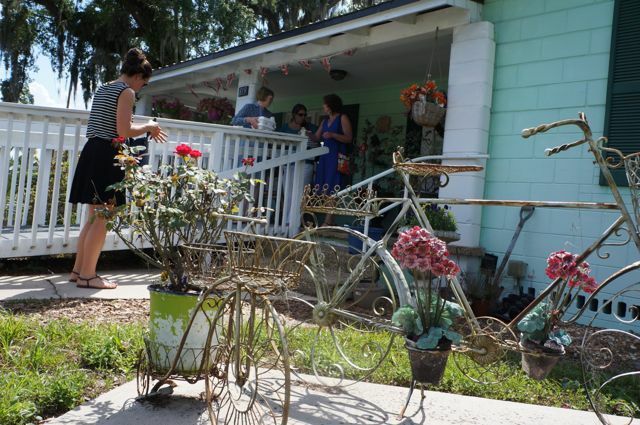 Polly’s Pantry is on the main route through Wildwood, a city in Sumter County and this cute antique-filled tea room is hosted by Tricia Bennett and her husband John. Tricia is a published author of “Polly Brown”, “The trouble with Polly Brown” and “Princess Polly” as well as a popular guest speaker. 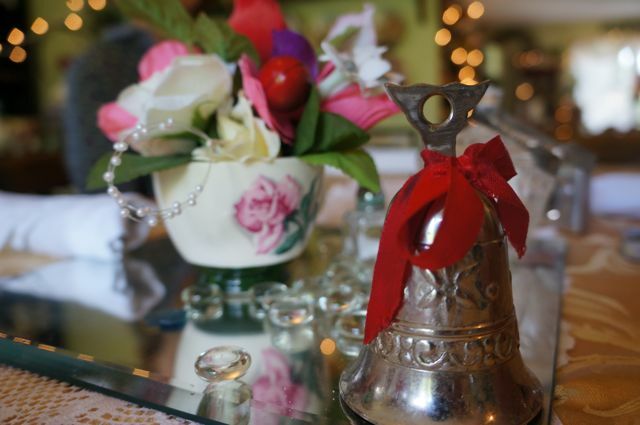 This tearoom is themed on the “Polly Brown” book, providing lunches such as soups, salads and filled sandwiches, light snacks and full afternoon tea tiers for their guests on pre-arrangement. My new and lovely friend Trish had booked six of us in for a ladies lunch to get away from the boys for a few hours, it was the perfect retreat to enjoy a leisurely afternoon out of the heat of the day. 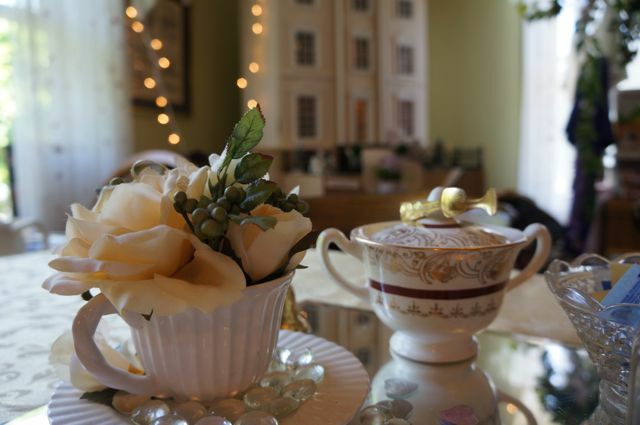 When you walk up the porch steps and into the front tea parlour, you’re welcomed with smells of freshly baked scones and the chink of treasured vintage china as Floridian ladies (and gents) who lunch on homemade quiches and afternoon tea tiers sip on Earl Grey Tea, chattering at leisure. They serve a superb afternoon tea , with us opting for the full works; the “Harrods High Tea”. 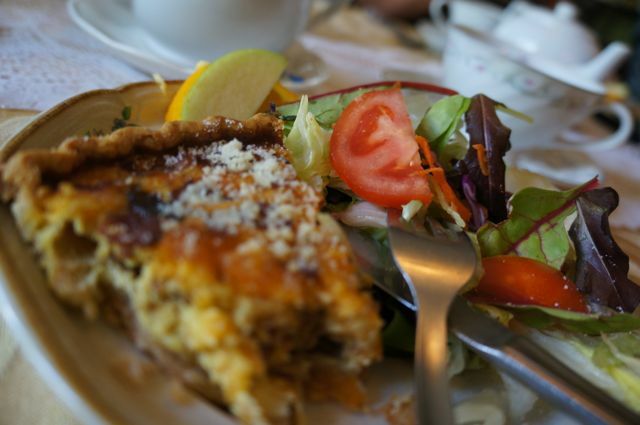 This included a pot of tea (or a large glass of flavoured iced tea), warm homemade quiche & salad, finger sandwiches, scones and a selection of dainty cakes & sweet treats. I went for a pot of Lady Grey tea, my very first cup of British tea since I had arrived and it was the perfect option for my afternoon, I actually stuck with it for the rest of my stay. 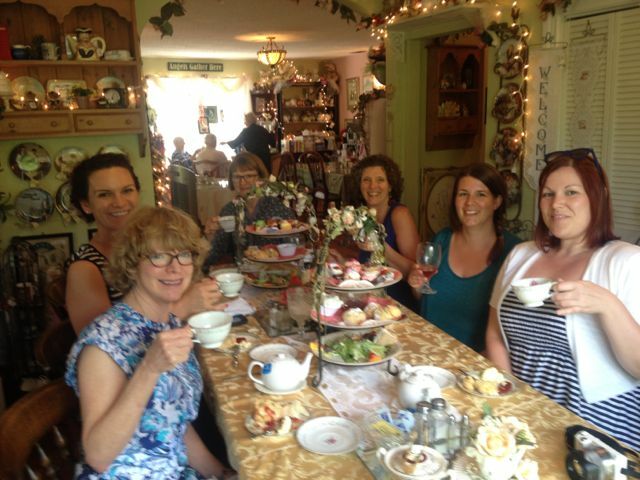 Some of my fellow ladies went for peach or even raspberry flavoured iced tea, a great and refreshing way to sip on tea that afternoon – it was warm to say the least and it was only Easter, goodness how it’ll be in the summer! I fell slightly in love with the tea chest carried out to us to pick our tea – it was a beautiful ornate chest with every flavour of tea you could possibly dream up. 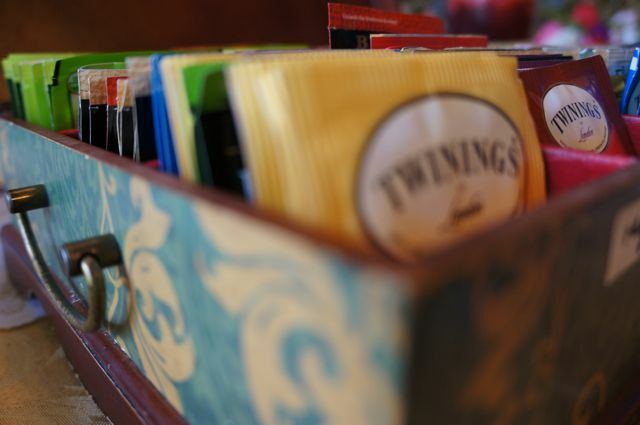 People who know me well enough by now would note that I usually scoff at Twinings as an option, however when you have lived on “lobby coffee” within a hotel for a few weeks, as good and strong as that may be, a cup of tea was very welcome indeed. 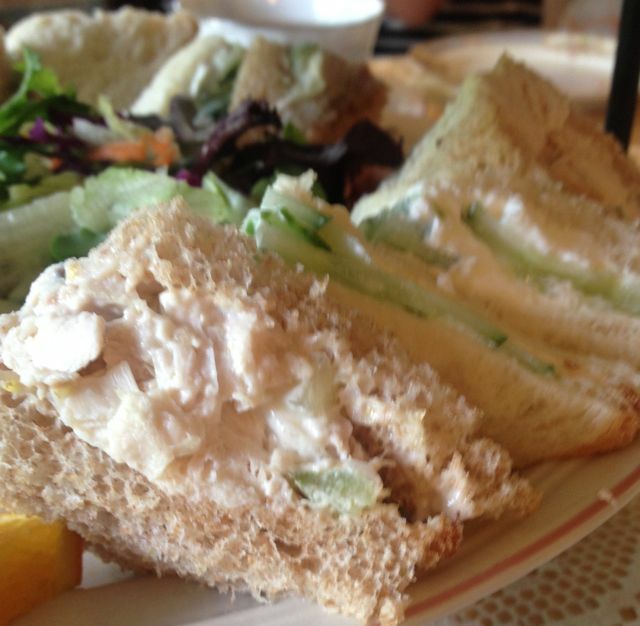 The finger sandwiches included cucumber & cream cheese (a flavour combo new to Trish and I think she is now hooked hehe), Chicken Salad (almost like a creamy coronation checking, delicious) and egg mayonnaise with watercress, delicious. 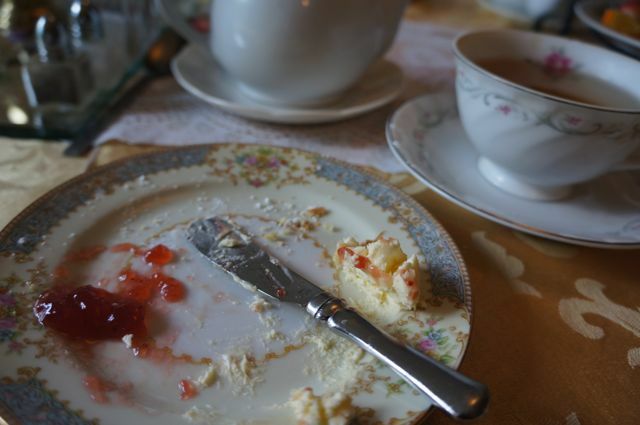 There were fruit and plain scones to choose from, with lashings of strawberry jam and clotted cream. We were actually given a choice of cream – either “proper” British Devonshire clotted cream or whipped double cream… of course we went for the proper stuff, it would have been rude not to. Tricia actually ships this in especially, as it’s not easy to come across in America, so once you buy a pot, it’s yours and we were allowed to take the rest of it home, fantastic. 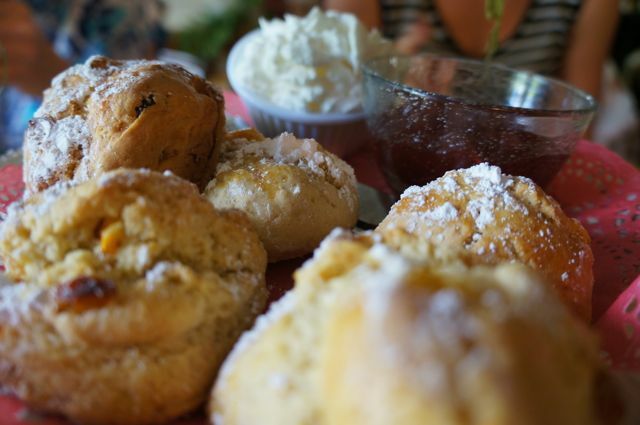 We let Trish take this as again, it was her very first experience of clotted cream… I’m not convinced she liked this as much as we do, but I can only imagine this is pretty alien to somebody who’s never had such a rich element to their scone before, it can be an acquired taste. There was just so much food… you can see for yourself from the photos I managed to take between nibbling. It was fantastic value for money and I’d highly recommend it to anybody visiting this area in Florida, it’s a GEM. 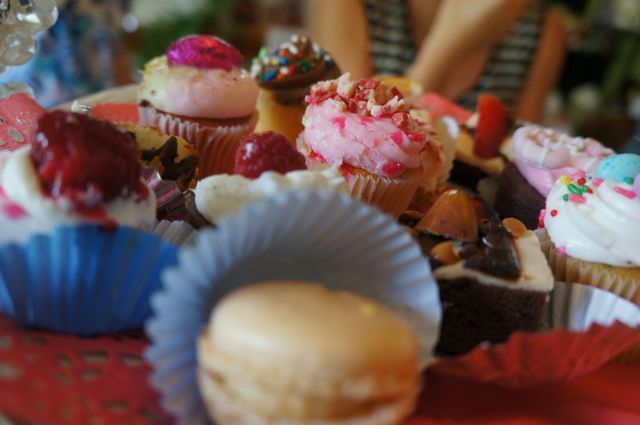 I would also love to be able to tell how all the little cakes tasted, but we were so full by the time it came to the cake courses, we simply couldn’t find the energy or space in our tummies to venture into them all. I managed to have a nibble on a deliciously creamy piece of New York cheesecake and a slither of gooey chocolate brownie later that day, but they were all boxed up and taken back to a family BBQ that night for munching – there were plenty of happy cake-smeared faces. We spent hours here, peeking into the stunning dolls house behind our table, nosying at trinkets for sale, chatting to the owners about all things “British” and ‘Royal” and I even taught my fellow diners some afternoon tea etiquette as we tucked into each course. 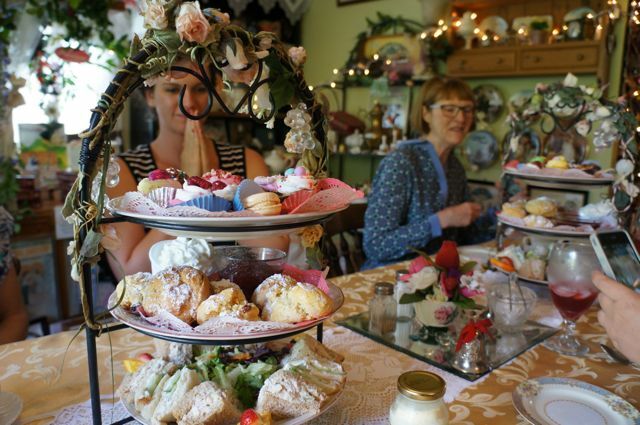 In fact, if Tricia and the team at Polly’s Pantry ever fancied co-hosting an afternoon tea etiquette event, I’d be back in a heartbeat, I’d be just thrilled to work with such a passionate venue on something like this – a girl can dream. And lastly, I owe a HUGE thank you Trish for arranging such a lovely afternoon out for us all, it was a great way to celebrate my birthday whilst out here, although a few days prior to the actual day, I felt thoroughly spoilt and can’t help but smile at how amazing life has got over the last few months – this was a visit to remember. Polly’s Pantry is on the 301 at 819 S.Main Street, Wildwood 34785, next door to the BB&T bank. For my full Facebook photo album from this visit, please click here.